Can you imagine anything more magical than a blue sea as the backdrop for your wedding Ceremony during a breathtaking Mediterranean sunset? 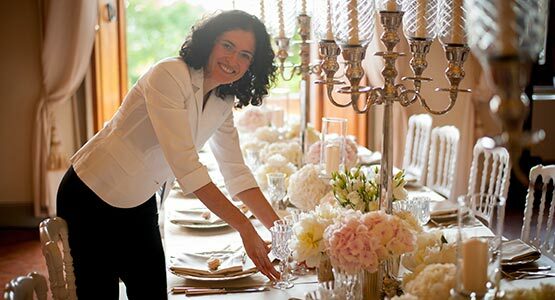 This is not a dream but a once-in-a-lifetime wedding experience, a memorable Italian wedding we can plan in one of the private Villas by the sea we have carefully selected for a really exclusive event in the Italian Riviera, Capri, Sorrento, on the Amalfi Coast and Puglia. Italian Villas by the sea combine classic architecture with a modern Italian design, they were originally residences of noble and prominent citizens and have then been restored and tastefully renovated to offer all the comforts and convenience of present day. 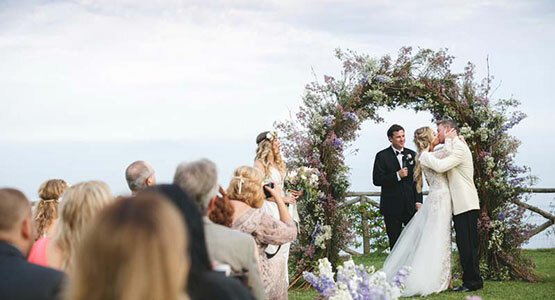 Both your wedding ceremony and reception can take place on private terraces, pergolas or gardens overlooking the sea and the impressive coastline. Our selection of Villas allows our couples and their guests to enjoy an event characterized by a pleasant combination of traditional local culture, charming design, antique and valuable furniture, refined elegance and a beautiful mix of natural materials like wood, stone and ceramics. Your waterside wedding in one of the private Villas we propose will be unforgettable. 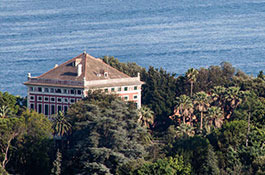 Impressive historical villa with secular park and panoramic terraces overlooking the sea. Ideal for events up to 150 guests. Villa accommodates up to 40/45 people. 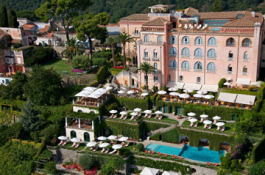 Five star luxury hotel located in Ravello. 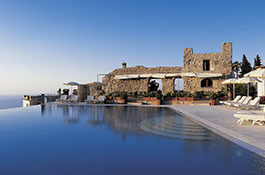 Panoramic garden and terraces overlooking the sea, ideal for events up to 130 guests. 50 rooms and suites available. 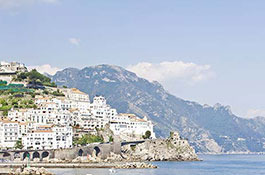 Private Mediterranean villa overlooking the Amalfi Coast. The venue can be rented on a daily basis. Recommended for parties up to 150 guests under their panoramic gazebo. 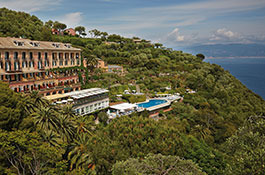 Stunning 5 star deluxe hotel located in a 12th century villa perched on the cliffs of Ravello. Ideal for intimate weddings up to 75 people. 32 rooms and 11 suites for accommodation. 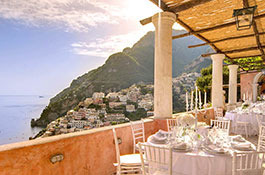 Luxurious historic villa above Positano suitable for intimate and refined events up to 90 guests. 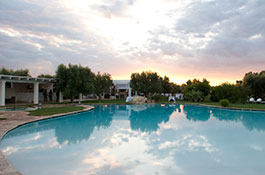 Accommodation in 8 exclusive suites. 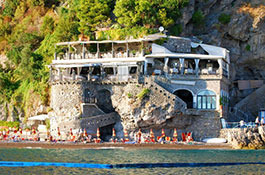 Stylish and modern restaurant on the beach in Positano with panoramic terraces overlooking the sea. 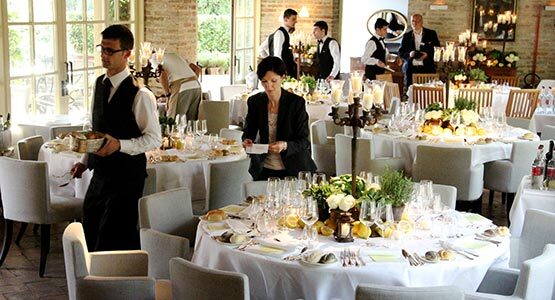 Ideal for candlelit wedding receptions up to 100 guests. 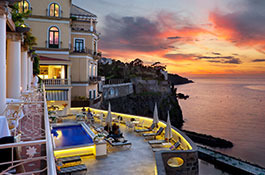 Five star luxury hotel in Amalfi, located in a quiet and secluded position. Panoramic beach restaurant for parties up to 150 guests. 62 rooms and suites available. 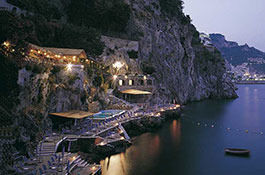 Perched on a clifftop 80 mt above the sea, this luxury hotel enjoys spectacular views of Amalfi. Impressive halls and terraces for events up to 160 guests. 53 double rooms available. 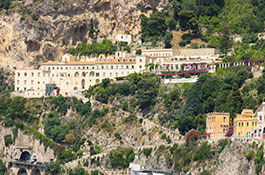 Once a medieval convent, now a renowned hotel in Amalfi. 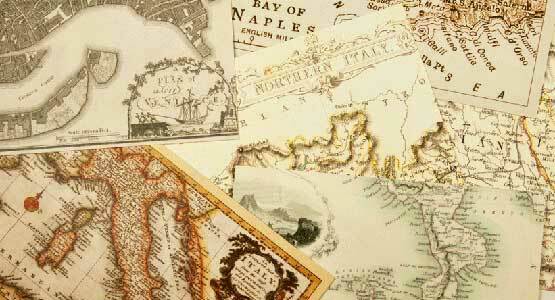 Several areas to cater beautiful events up to 120 guests. 40 rooms and 5 special suites. 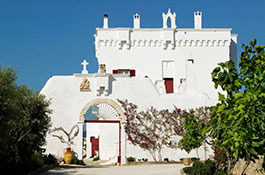 Enchanting masseria only 20 minutes' drive from the sea, recommended for intimate as well as large parties up to 150 guests. Accommodates 55 guests. Luxury property in a natural Apulian countryside, few minutes' drive from the sea. Recommended for groups of 100-120 guests. Accommodation on site up to 80 people. 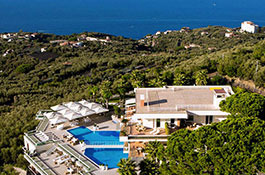 Luxury resort near the sea surrounded by olive groves and golf courses. Suitable for large events up to 500 people. 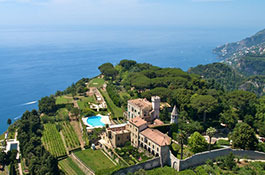 The hamlet features 28 villas, a hotel with 63 rooms and 92 houses. Enchanting farmhouse surrounded by olive groves. Nearest beach only 10 minutes' drive. 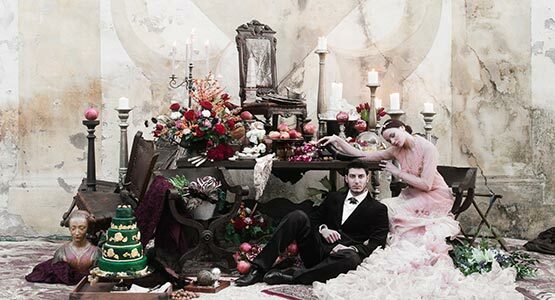 Wedding banquets up 100 guests, accommodation available for 42 people. 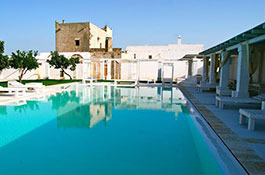 Quiet and elegant masseria in a natural countryside, close to the sea. Events up to 200 guests, accommodation available on site up to 30 people. 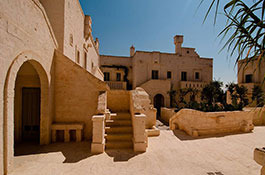 Historical Masseria located in a wide park with over 100 acres of olive groves and woods. Suitable for large events. This venue is rented on a daily basis. 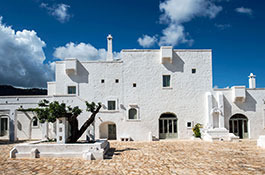 Typical Apulian masseria only few kilometers' drive from the white city of Ostuni. 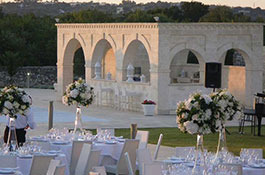 Its wonderful Mediterranean gardens are perfect for events up to 300 people. 19 double rooms available. 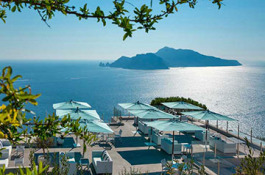 Exclusive and modern five star hotel located in Anacapri. 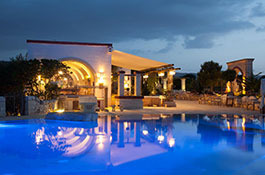 Exclusive parties in refined banquet halls or by the pool up to 180 guests. 81 contemporary style rooms. 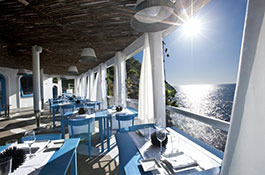 Modern Mediterranean beach club located in Anacapri. This exclusive restaurant has a panoramic terrace to host parties up to 170 people and panoramic solarium for after dinner parties. Enchanting bathing resort located in Anacapri near the impressive lighthouse. 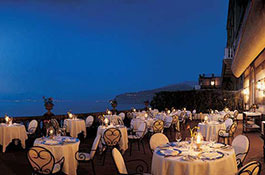 With its panoramic terraces overlooking the sea it is the perfect venue for parties up to 200 guests. 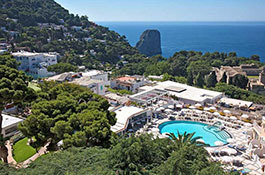 Historical hotel in the centre of Capri renowned for its excellent service and warm hospitality. Large halls to host events up to 500 guests. 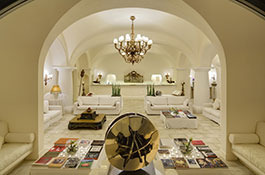 Small luxury boutique hotel located in the heart of Capri. Luxury and intimate wedding receptions can be organized in this property. 22 elegant rooms available for accommodation. Panoramic villa with fantastic outdoor terraces overlooking the sea. Suitable for parties up to 150 guests. 12 double rooms available. This venue can be rented on a daily basis. 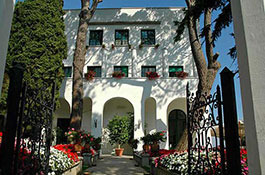 Charming Victorian style villa surrounded by impressive gardens overlooking the sea, can be rented on a daily basis. Capacity up to 280 guests. 11 comfortable rooms for accommodation. 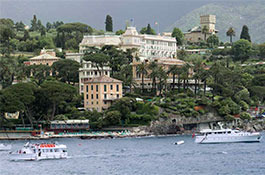 Historical five star hotel of aristocratic charm and opulence overlooking the sea. Wedding receptions up to 200 guests. 105 charming rooms. 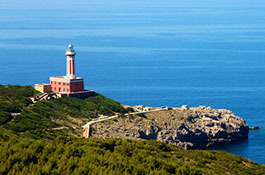 Spectacular location for romantic weddings surrounded by the blue sky and crystal-clear blue sea. Reception up to 60 people, 100 with exclusive rental. Accommodation in 15 elegant rooms. 18th century building located on a cliff in the heart of Sorrento. Different spectacular terraces available for parties up to 150 guests. Accommodation on site in 50 welcoming rooms. 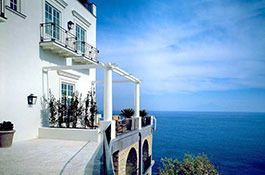 Elegant Ligurian style hotel located on a promontory overlooking the sea. Wedding receptions for up 120 guests. The hotel features a total of 83 rooms and suites. 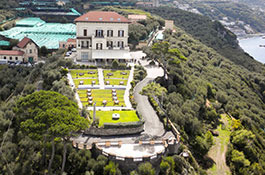 Historical palace converted into a charming hotel surrounded by a large park sloping down to the sea. Suitable for events up to 200 guests. 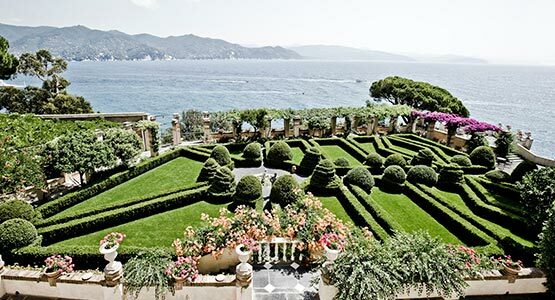 Magnificent 17th century villa surrounded by Mediterranean park overlooking the Gulf of Santa Margherita. Venue to be rented on daily basis and suitable for parties up to 200 guests.